Not every bike needs a bell, but depending on your commute you may want to think about getting one. There’s a bike path in my city that attracts walking tourists. It isn’t uncommon for a tourist to mindlessly walk in front of my wheel or cross the path without looking around. These are the moments when having a bell comes in handy. Give it a ring-a-ling-ling to announce to the world that you are rolling through. There’s many options when it comes to bike bells. Here’s a summary and review of the best bike bells that not only sound good, but look great too! Companies that make bells love their puns. There’s something about a bell pun that has a nice ring to it I suppose. (I know, bad joke!). The company Mirrycle created the Incredibell Adjustabell which is the right price (cheap) and gets the job done (rings well). If you didn’t pick up from the name the bell is adjustable and will fit on bars with diameters ranging from 15mm to 39mm. The actual dinger of the bell adjusts to any position around the bell dome making it available for your thumb or any finger to use. It comes in black and silver. It’s made of a light alloy to prevent rust. The bell is loud with a single ding. If you’re not looking for anything fancy than I would recommend the Incredible Adjustabell. You can check it out on Amazon. This gem looks beautiful. It is sleek, elegant, and comes in four different color variations. KONG designed this bell to hug the handlebar, and even fashioned it in a way to let your wires run through the bell. Out of all the different bells I like the look of this one the best. The way the company KNOG described the sound made me laugh. It is “like an angel playing a glockenspiel.” While this bell looks great there is one problem. The sound it produces is not very loud. Apparently the angel is not playing the glockenspiel as hard as he should. If you’re looking for something that definitely will grab the attention of those nearby and announce your presence than the Oi bell isn’t for you. You can view this bell on Amazon here. Sometimes you are just looking for fun, and the Kickstand bells hit that criteria. These classic bells come in over 15 different colors to perfectly fit your bike. They won’t settle with a boring noise either as these bells produce a fun “ring ring” sound. They fit most handlebars, and would make a great addition to your commuter bike. 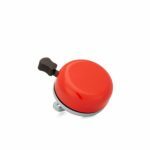 You can view all the colors of the Kickstand Bells on Amazon. This is the bell (on Amazon) for those of you who are looking for something that is cheap and works. Nothing magical about this bell other than the fact that people will turn their heads when they hear its ding. It will fit on most bikes and will work with any budget. 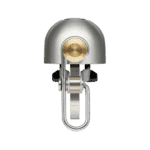 This tiny bell comes in silver and gold. A classy bell that you can get in copper or brass. Depending on how far back you pull the lever will determine the volume. At full volume it is LOUD, but can also be softer if you are in need of a more polite bell ring. It is more costly compared to other bells, but it is top quality. Very easy installation as well. View the details for the Crane Suzu bell at Amazon. 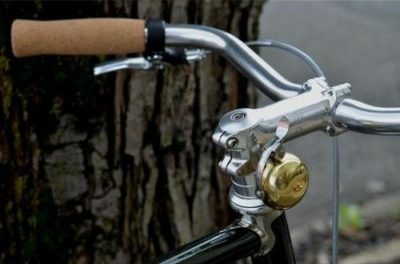 Portland Design Works decided to create a bell that bypasses the handlebar altogether. This bell attaches to the steerer tube (see photo above). This frees up space on your handlebars for those of you who like to keep your handlebars clutter free. It is made of solid brass, and has a pleasant ring to it. See more details at Amazon. Can you love a bell? 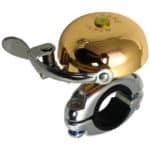 This company in England made this incredible retro bike bell that hits all the marks. It looks great and sounds wonderful. I like how long the ding sustains. You can hear the sound of it by clicking on the sound below. 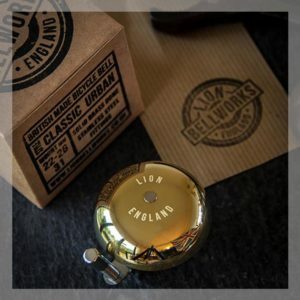 It’s a 55mm solid brass dome with the “Lion England” logo engraved on it. Listen – if you are looking for a great gift for a bike commuter just know that if you bought this for someone they would love you forever. 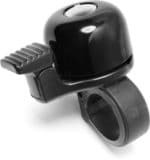 You can view more details and purchase the Retro Bike bell here. Just a reminder it ships from the UK. You can’t make a list on bicycle bells without including Spurcycle. They have their fandom in various cycling circles, and for good reason. They produce quality products that do their job well. These bells are made in the United States, and have a lifetime warranty. They are a bit pricey, but are made to last forever. If you’re looking for a solid look, a great ring, and the sturdiness to last as long as your bike than look at picking up the iconic Spurcycle bell. Give this one polite Ding! Ding! to alert pedestrians, vehicles, and other riders of your presence. The Lezyne classic has a distint ring to it. I found this bell to hvae an unusually low profile and modern look to it. 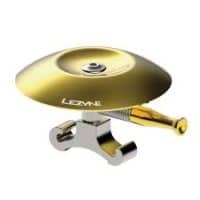 It is able to be mounted on a variety of handlebar sizes, and is made of high-polished brass. This one might be harder to purchase online as you’ll need to find a dealer. I would advise checking in with your local bike shop to see if they are able to order it. You can check out more images of this bell and look at the details on Lezyne’s website. 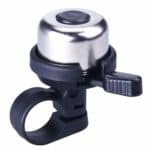 What do you need to know about purchasing a bicycle bell? Bike bells are simple. There are only three things you need to know. Do you like the noise that it makes? Bells range in volume, the actual sound, and how long they sustain the ring. There are some bells that give a DING! while others sound like a typical doorbell. Secondly, pick a bell that fits the style you are going for. 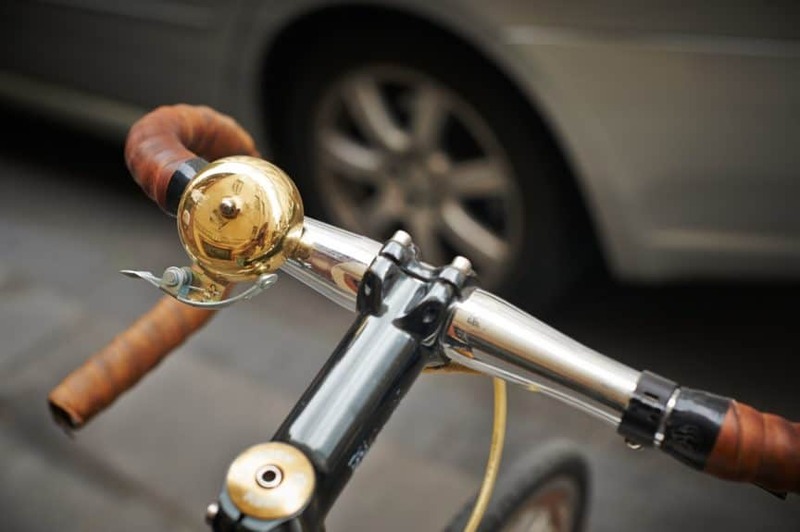 Lastly, you will want to make sure you order a bell that will fit onto your handlebars. Some bells are designed with a one-size-fits-all type installation. Other bells will only fit if you purchase the right size. You will need to know the diameter of your handlebars to purchase the right size. You can easily determine the diameter size by wrapping string around the handlebar and than laying that piece of string over a ruler. Should I install a bell on my commuter bike? Personally I am a proponent of minimalism when it comes to bike accessories. Is a bell necessary for bike commuters? Absolutely not. But could it be helpful? Yes. I would highly recommend installing a bell on your bike if you ride on a route that is well congested. Instead of constantly having to slow down and having to say “excuse me” over and over, you could simply ring a bell. When I lived in Amsterdam every single bike had a bell attached to it. If you were walking down the street and you heard the ring of the bell you knew that a cyclist was coming, and you had better get out of the way. I hope one of these bells will fit your bike commuting needs! I’ll keep this article updated if I come across any other unique or significantly good bells.